Get fitness and wellness info for healthy aging sent to your inbox by Subscribing to our newsletter. You WILL NOT get spammed daily! Build your fall prevention balance! 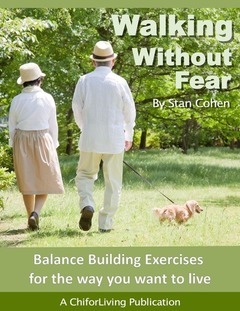 Stan Cohen's Walking Without Fear contains 16 exercises which helps you build leg strength and balance. Great for Seniors for fall projection or anyone looking to become more stable on their feet. Check out ChiForLiving on Facebook! ChiForLiving's Facebook page includes health and wellness articles and information for seniors and family caregivers. Like Us and please help spread the word. These exercises are great for those who are chair bound or cannot stand to exercise. Also perfect for Caregivers who wish to exercise with those they care for to help improve their health and fitness. We have found the most effective home study course on the market. Check out the program. Continue to remain active as you age! When there are so many Tai Chi and Qigong options, where do you start?